We customize every job to your needs. No two jobs are ever alike! Hi ! My name is Mary. I have been a Dance Instructor for over 27 years. I have been instructing at the Vero Beach Community Center for 4 years now. I was a Line Dance Instructor at Southern Regional Adult School in NJ for 18 years. I am accredited through the NTA in The Fundamentals of Line and Couples Dancing, as well as Two Step, East Coast and West Coast Swing. For A great time and lots of fun let us add some dance lessons at your next event! Hi, My name is Joe. Playing music is my passion. Mary & I have been working together for 18 plus years. 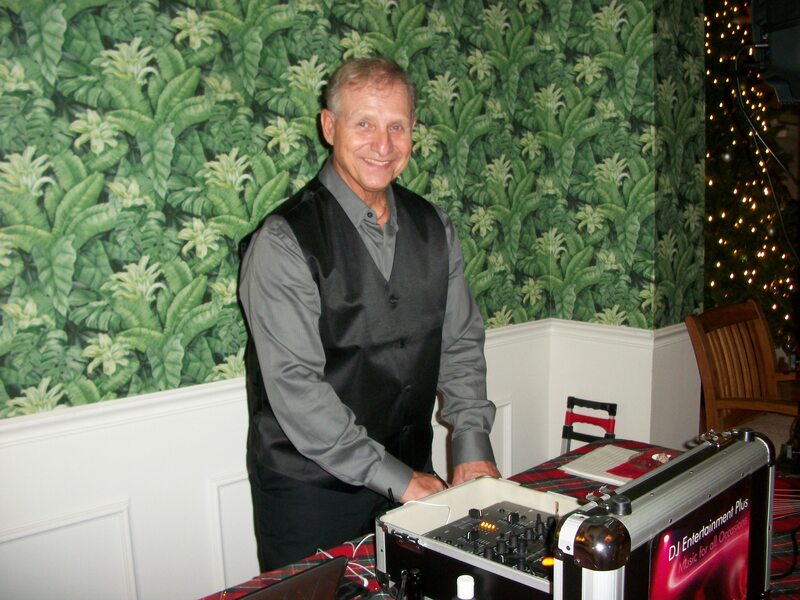 We DJ all types of events and play all types of music for all age groups. We are currently Instructing in Country Line and Partner dancing at the Vero Beach Community Center . Fort Pierce, Port St. Lucie, Stuart and beyond! Why wait, start booking today! 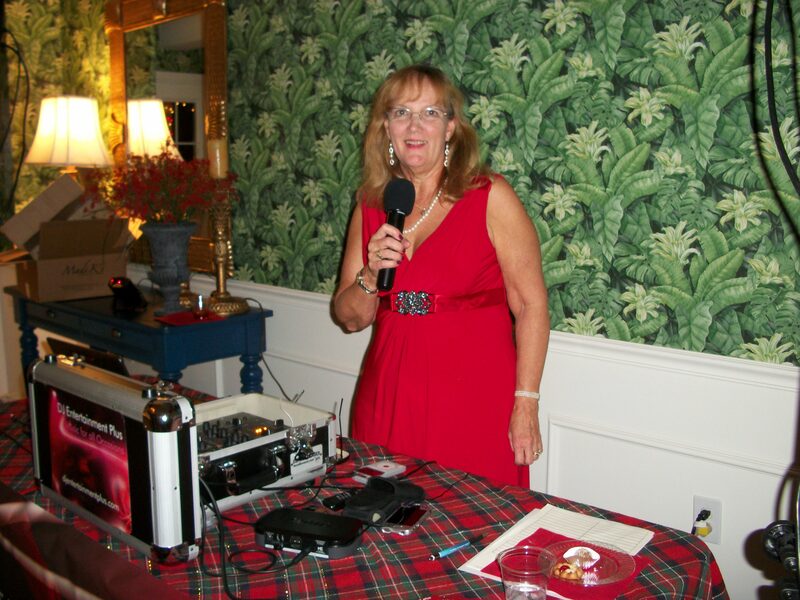 For DJ service or line & partner dance instruction, Call Mary & Joe of *DJ Entertainment Plus* We specialize in "FUN" and play all types of music for your next Holiday Party, Birthday Party, Family Reunion, Fundraiser, Backyard Barbecue, Anniversaries, & Dance Events. In this section we will list our Dance Classes & Upcoming Events. Please check in frequently for new update ! 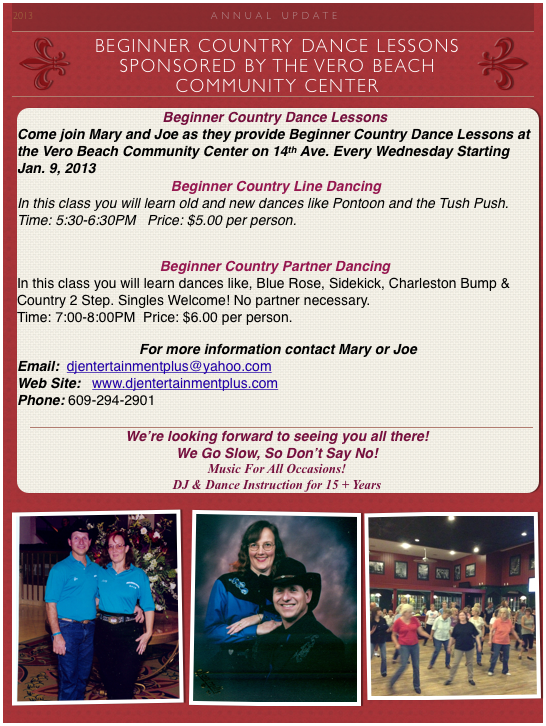 Come out and join us for Line dancing and some circle Partner dances thrown in. We will work on beginner Dances for the first part of Class. We will then do a high beginner or intermediate dance and then occasionally a circle Partner dance that is fun for everyone. Your will have the opportunity to practice dances you learn in between lessons as a review. I hope everyone will like the new format. The Cost for the 1 hour beginner class is $6.00. If you want to stay for 1/2 hour of Intermediate dances the price will be $8.00 in the new season. For Partner lessons I need 8 people to hold a class and prepay 4 weeks. $32 each. We Go Slow, So Why Say No! a couple times during the season. Break Away, Zjozzys Funk, Flatliner, Heartache on the Dance Floor etc. Dates we are Closed - No lessons! Usually The 1st Saturday of every month from October to May. Dates: See you in November! Come join us as we DJ in the park and provide nonstop entertainment, music and dancing from 11 to 3pm the 1st Saturday of every month from Oct. to May @ the Sebastian Riverview Park Craft Show on Route 1, Sebastian. We play all types of music and you can come out and dance the dances you learn in classes and shop the Craft Club of Sebastian Vendors.